Rinse and dry salmon fillets. Cut them into small dices (around 1/2-inch square). 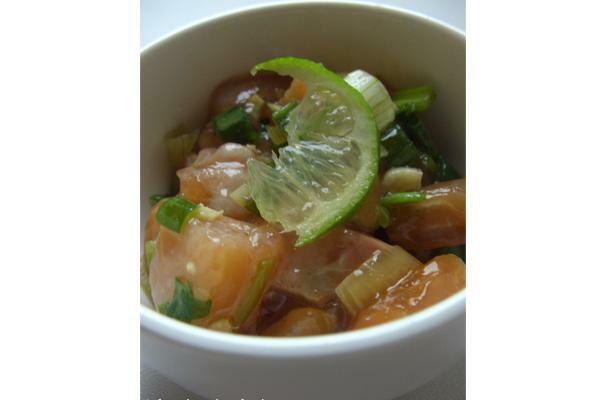 Combine salmon, spring onions, ginger and sweet soy sauce. Cover and leave in the fridge for at least 30 minutes. Serve in Chinese soup spoons, small individual ramekins or glass cups leaving marinade in the plate. Rinse lime and grate zest over individual portions. This salmon tartare has been part of the appetizers I made for New Year’s eve dinner and I must say we all enjoyed it. At first, I was planning on using salted soy sauce and pretty disappointed when I found out I didn’t have any. Well, now I can say I’ll do it again with sweet one. It tastes amazing with ginger! I kept lime as a last ingredient to give this tartare a fresh taste. If you want to experiment you can also add the grated zest before marinating but don’t forget lime juice has to be added last if you don’t want your tartare to turn out being a ceviche! This ginger and lime salmon tartare recipe is meant to be served in appetizer spoons or small verrines (glass cups) but if you wish to have it as a unique starter, count about 4.5 oz per serving and adapt the ingredients’ quantity accordingly.